Northern Alberta’s forestry industry will see 170 new jobs as Tolko’s High Prairie mill reopens with support from the Capital Investment Tax Credit (CITC). 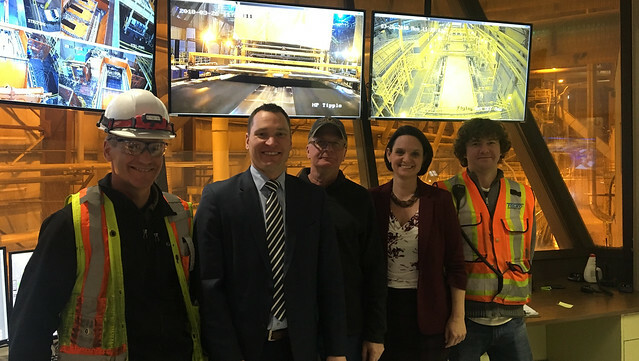 Minister Bilous tours Tolko High Prairie mill. L to R: Greg Johnston, general manager, Minister Bilous, Lesser Slave Lake MLA Danielle Larivee and Dean Lamberton, plant manager. The forest-products company received conditional approval of a $4-million tax credit to restart its strand-board mill in High Prairie and modernize two mills near Slave Lake and High Level. The High Prairie mill closed in 2008 and reopened earlier this year, employing 170 people. Tolko supports an estimated 1,500 direct and indirect jobs through its three operations across northern Alberta. The CITC helps Alberta companies take on new construction projects by returning up to 10 per cent of the costs of new machinery, equipment or buildings to a maximum of $5 million. Businesses can claim the credit once the assets they purchased are in use. The CITC program supports the government’s work to diversify the economy, with 18 businesses from a variety of sectors taking advantage of the second intake. New projects include building a cannabis manufacturing and processing facility, a skydiving facility, a craft brewery and tap room, a biofuel facility and a glass factory. Expansion projects include upgrades at a precision machine shop, a trailer manufacturer, a metal manufacturing plant and pulp mills. Through Budget 2018, the CITC has been extended to 2021-22 with an annual budget of $30 million. Credits from the first and second round of the CITC are expected to support more than 3,000 jobs, with companies investing more than $1.2 billion to build or upgrade their facilities. The maximum value of the non-refundable tax credit is $5 million per company. The total value of the first two rounds of credits is about $62 million. The third CITC intake window opened Jan. 15 and closed March 16, 2018. Third intake applications are under review. Dates for upcoming application intakes will be shared once finalized.